Modern navies are a trade-off between advanced technologies and cost, in both construction and operation. Versatility, flexibility, and affordability are key criteria which governments need to balance as warships become an exportable commodity, where market value is just as important as the strategic value of any newly built vessel. A key theme in many new builds, that goes some way to address the inherent compromises in warship design, is modularity. The development of the Royal Navy Type 26 Frigate and the Littoral Combat Ship in the USA are cases in point. Modular design allows adaptability in meeting threats from smaller vessels, used by pirates and terrorists, to larger threats from enemy navies. While these examples come straight from the drawing board, other countries are adapting existing platforms to meet the ever changing strategic landscape. • Lessons Learnt from Surface Vessel Projects. 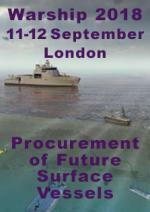 HotelsCombined.com, the world's largest hotel price comparison website, is offering support to participants of the Warship 2014: Submarines & UUV’s conference. An exclusive 10% rebate is given to hotels booked via their website for all attendees.